16 oz. squirt or spray bottle.Fill the bottle almost full with distilled or purified water (the minerals from your tap water may inhibit the cleaning action of the soap). Add 3 T. of your favorite liquid dish soap after you’ve added the water to prevent it from sudsing as you fill it up. (Eucalyptus, lavender or orange scented soaps are nice). Add 20-30 drops or more of tea tree oil for the antiseptic power. This is safe to use on floors, laundry, toys, doorknobs, bathtubs, toilet seats and more. This is a terrific recipe to wash those little hands, too. It is a refreshing alternative to those expensive antibacterial soaps. Dilute with ½ c. distilled, purified or RO (reverse osmosis) water. Add 2 T. vinegar last. Stir till lumps are gone. Make sure to add enough water so that you can pour this one easily. It can be used on any greasy grimy job, garbage cans, tub, sink, tile, toilet bowl. Can spray on and wipe off or put 1 c. in a large bucket of hot water for large jobs. Mix ingredients together and use as you would a commercial bleach product. This is a safe level bleach that is not too harsh and will fight dinginess in fabrics. (check labels for “moderately bleach safe”). Shelf life 3-6 months. 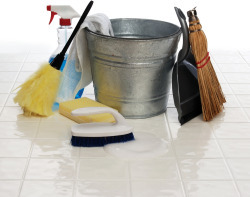 You'll use this recipes in other homemade cleaning supplies. You can use Dr. Bonner's liquid castile soap or Make your own with Kirk’s Coco Hardwater Castile bar soap. Add 3 ¾ C. boiling purified water. Stir until melted and store in a jar. Club Soda in a spray bottle or Fill an 8 or 16 oz. spray bottle half full of purified water and half full of vinegar. Add up to 8 drops of essential oil. Dry the window or mirror completely for this one. Mix into a paste and use a scrub pad to clean oven. The recipe will foam so mix it in a large container. This is basically a 50/50 mixture. So make up just enough for use as it does not store well. This same formula has long been recommended as a drain cleaner. Just pour it down your drain and flush with boiling water. Baking soda with peppermint, lemon, lavender, tea tree or eucalyptus essential oil added will clean sinks, tubs, showers and will freshen your drain. Just sprinkle, scrub down, rinse and dry. To a 2 lb. box of baking soda, add 25 drops or ¼ t. food grade quality pure essential oil. Put in a shaker bottle under your sink. To a gallon of distilled white vinegar, add 50 drops of peppermint, orange, lavender, lemon, tea tree or eucalyptus oil. Put in a spray bottle to clean off countertops, clean out the fridge etc. A great book on homemade cleaning supplies, what is in them and what to replace them with is “Clean House Clean Planet” by Karen Logan (clean your house for pennies a day the safe, nontoxic way).